The Swagtron Cali Drift is a fascinating new e-scooter that will rivet the attention of enthusiasts for a long time to come. The main attraction is a swiveling feature that allows the rider to carve as far as 8 degrees as if they are riding a longboard. The comparison is no surprise coming from Swagtron, a company known for creative designs across scooters, skateboards and electric bikes. The stem and handlebar take center stage in the riding experience since they pivot allowing you to carve along the road with undisputed control of the ride. With the 250-watt rear wheel electric motor, you can easily achieve speeds of 15.5 miles per hour using this three-wheeled electric scooter. The e-scooter covers 9.4-miles on a single charge of the Lithium-ion battery. This can serve a variety of functions such as commuting to work, shopping or leisure rides in the neighborhood. See the top electric scooters here. The Cali Drift has a lever on the handlebar, right at the right thumb position that is used to control the speed. Slowing down or stopping is made even easier by the option to use a lever-activated brake or the typical one at the rear heel or both of them at the same time. It does have a slightly different handling from your Razor E200 or the GOTRAX GXL, it gives you great control and confidence with every turn with its handlebars. This unique e-scooter has two front wheels and one rear wheel. With the flexibility of pivoting the handlebar and stem, this device has produced an exclusive riding experience for users. 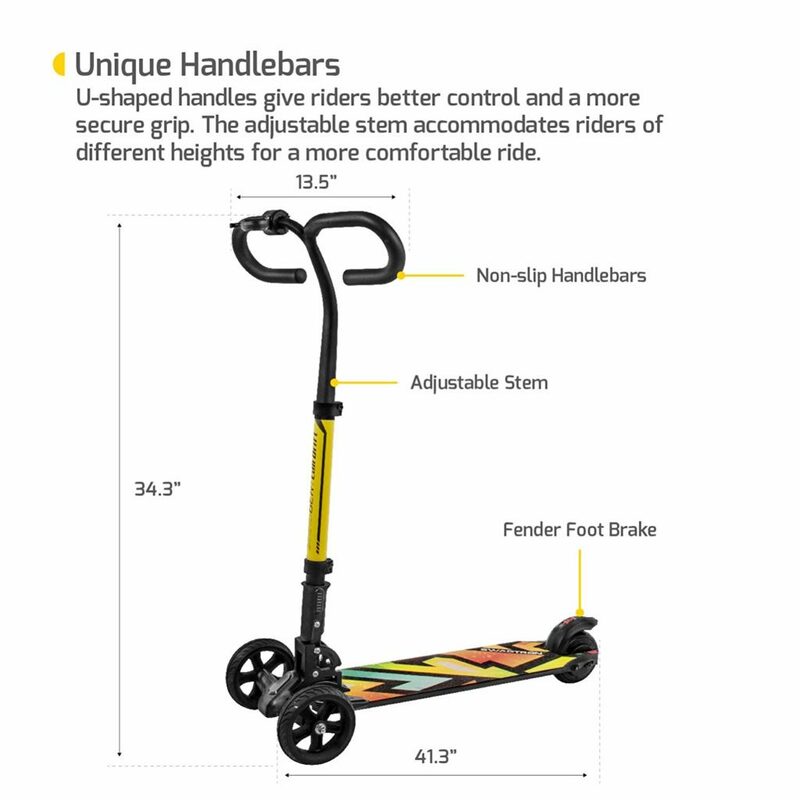 This e-scooter has a stem that not only pivots but is also adjustable to fit riders with different heights allowing it to be used across the board. The Cali Drift brings out a seamless experience encompassing recreation and transportation in a distinctive way that is attractive to users of any age. It epitomizes the evolution of the e-scooter. The sleek design helps the rider to maneuver with ease through crowded areas and narrow sidewalks. A thumb lever on the handlebar allows the user to accelerate effortlessly and the spacious deck has grip-tape that secures your foot to ensure that you do not slip. Vibrant colors complete the intuitive design of the Cali Drift bringing out a classic e-scooter with a modern touch. The Cali Drift is equipped with a 250W rear-wheel electric motor that can reach speeds of 15.5 miles per hour. If you have carved on a skateboard, you will be impressed by the spectacle of doing the same but with the power and stability of the Cali Drift. The three-wheel design helps to unleash maneuvers in ways that were previously impossible with two-wheelers which give confidence to riders. It won’t feel weak even when you compare it to the monstrous Super 1000-Watt Elite Scooter because with this one you get power with the control and confidence in riding it. The 3-wheel configuration brings out a scooter that can claim enhanced stability and necessary traction which cannot be found in the traditional two-wheelers. Riders who have experienced challenges of balancing while using two-wheelers will find comfort in the 3-wheel design that will not only stabilize their ride but enable them to try out new moves. 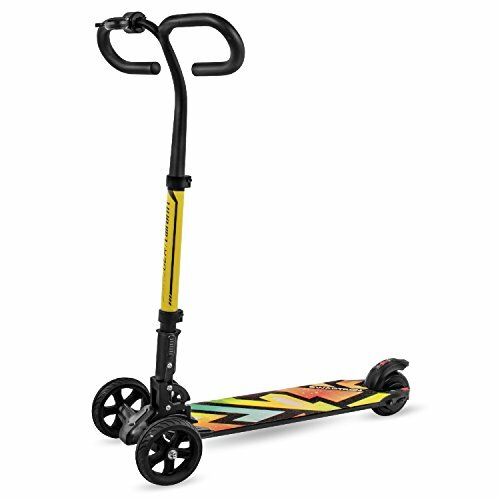 The added grip tape on the deck ensures that your foot doesn’t slip while you maneuver corners using this modern age scooter. This e-scooter has adjustable handlebars to suit users of different heights. The handlebars are U shaped to give an ergonomic grip that not only gives comfort but ensures control when riding around tight corners.The scooter controls are conveniently located on the handlebars. The throttle lever allows you to accelerate rapidly and easily rein in your drift while the brake controls help you to slow down as you drift away. Whether the only available space is under your desk or the trunk, the Cali Drift is a lightweight e-scooter that folds up neatly for stress-free storage. Weighing 22 pounds and folding at the stem and handlebars, this magnificent e-scooter is portable to your preferred destination ready to hit the road. The scooter can support riders weighing up to 264.5 pounds. The lithium-ion battery has the capability to cruise for up to 9.3 miles on a single charge. With speeds of up to 15.5 miles per hour, the Cali Drift’s battery will need 2.5 hours to recharge and get you back on the road. With adjustable handlebars, the Cali Drift is designed to fit everybody irrespective of your height. All you need to do is adjust the handlebars to your preferred height and hit the road. The U shaped handlebars provide ergonomic grips for your comfort and safety enabling you to perform maneuvers with confidence. Just like other scooters like the KKA portable scooter, the Cali Drift has a thumb throttle and brake controls located on the handlebars ensuring that riders can be able to accelerate rapidly and at the same time have effective braking at their fingertips. The e-scooter has an additional footbrake for maximum safety. The rider has the option of using the handbrake, the footbrake or applying both at the same time. The Cali Drift’s over-sized deck ensures that you have the proper alignment so that you don’t lose your footing while navigating corners. The added grip tape on the deck ensures that your foot is firmly held and doesn’t slip off the deck. This added stability allows riders the freedom to perform various maneuvers and put their skills to the test. The stem is shaped to shift from side to side for meticulous maneuvers that will awe everyone. With this kind of design, this e-scooter can carve like a skateboard but with the added advantage of stability brought about by the three-wheel design and the tight gripping deck. The stem can carve up to 8 degrees giving riders flexibility to try amazing moves. The Cali Drift’s firm rubber wheels are designed to ensure a smooth ride for the adventurous user by providing enough traction on the road which also increases the stability and safety of the rider. The wheels feel lighter and responsive but perform almost similar to the Razor AX200’s wider traction. The 3-wheel configuration brings out a scooter that can claim enhanced stability that cannot be found in the traditional two-wheelers. This increases the traction and helps the rider to balance effectively for enhanced flexibility to carve. 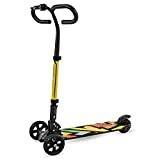 The added grip tape on the deck ensures that your foot doesn’t slip while you maneuver corners using this modern age scooter. The scooter controls are conveniently located on the handlebars. The throttle lever allows you to easily rein in your drift while the brake controls help you to slow down as you drift away. The swiveling stem is shaped to shift from side to side for meticulous maneuvers that showcase the scooters functionality and will awe everyone. With adjustable handlebars, the Cali Drift is designed to fit everybody regardless of their height. The U shaped handlebars provide ergonomic grips for your comfort and safety and are equipped with all the controls for ease of operation. The Cali Drift weighs 22 pounds and may be heavy to carry for some users. This electric three-wheel scooter is designed and intended for intermediate to expert riders who are keen on style and performance. The dazzling design is not only daring but enticing for teens, adults and even an electric scooter kids who want to explore and conquer new frontiers. With a maximum carrying capacity of 264.5 pounds, the Cali Drift can be used by a wide variety of individuals commuting to work, shopping or for leisure rides. We definitely like the Cali Drift because of the advanced features that enhance safety and performance. The three-wheel design outsmarts its competitors and gives it a world-class performance drawn from its stability. The use of a swiveling stem together with rounded handlebars creates some unique maneuverability and drifting that stands out among many other e-scooters. The ordinary electric scooters do not stand a chance on this one. This e-scooter was clearly designed for performance. The Firm rubber wheels provide a smooth ride and the throttle and brake controls located on the handlebars ensure that you are able to accelerate rapidly and at the same time have effective braking at your disposal with the additional footbrake for maximum safety. The 250-watt rear wheel electric motor enables riders to achieve speeds of 15.5 miles per hour using this three-wheeled electric scooter. The e-scooter covers 9.4-miles on a single charge of the Lithium-ion battery and will need 2.5 hours to fully recharge. This mileage can serve a variety of functions such as commuting to work, shopping or leisure rides in the neighborhood. Your feet stay locked into place with its over-sized riding platform and grip tape. The beautiful, non-slip deck is spacious and reflects an aura of modern design that is daring and attractive to teens and even an electric scooter for adults alike. With all these features the quintessential rider will appreciate that the Cali Drift embodies the essence of safety, versatility, comfort, and performance.